In July, I began planning for Grade 9 English with my teaching partner. I was (am?) new to the school, and my teaching partner and I had instructions to make some changes the Grade 9 course. One of the key changes (and perhaps my favourite) was the introduction of the portfolio as the final exam. The portfolio counts for 10% of the overall grade. They are introduced at the beginning of the semester, and students are given class time to complete a "Reflection of Learning" on a variety of formative and summative tasks. (This, as Sandra Herbst says, gets rid of the question "does this count?") In the last week of the semester, students are given more class time organize their portfolios and decide what pieces of work they will discuss during their exam interview. --Real world. Students are going to have to sit one-on-one with a person (potential employer, investor, etc.) and communicate their knowledge and understanding and discuss their strengths and areas of need. --Triangulation. Students use their products to engage in a conversation about their growth. Additionally, I am afforded the opportunity to observe the students prepare their portfolios. --Metacognition. All of our strands in English include an overall expectation about metacognition and the portfolio and interview are ways for students to engage. --Student Feedback. I was pleasantly surprised by the impromptu feedback that students provided. For example, I find the news report task less than engaging, but a couple of students said that they loved the opportunity to be creative. One student told me that she really liked the essay organizer. And another said that they really appreciated the choice in writing the series of paragraphs. --Listen more, write less. I was so worried about not having "proof" to back up the grade that I spent so much time writing during the interview. --Freedom. I have been pretty prescriptive about what students should have in their portfolio. I need to give time to the students to make decisions about their class work and what they want to include in their portfolio. --Reading. I need to be more explicit in my discussion and teaching of reading strategies so that students can effectively discuss their growth in reading. --Course Goals. These are very writing heavy, which I think is the result of the focus on OSSLT-skill improvement. I think we should re-evaluate our course goals and have them reflect reading, oral communication, and media studies. --Kill less trees. Eventually I'd like to move to online portfolios using myBlueprint. Overall, I found the use of portfolios to be a powerful learning and reflective tool and would LOVE to talk to others about portfolios so that I can improve my use of them. After Monday's disappointing lesson, I approached Tuesday's lesson a bit differently. I collected a variety of articles and videos for students to explore, and they had to come up with a verdict: not guilty, manslaughter, and second degree murder. Overwhelmingly, students believed that the correct verdict would have been manslaughter. I think they had an easier time with this, because it didn't involve the hard topic of race. That said, discussions of race and racism and the resulting injustices will never not be a part of my teaching. I'm still concerned that some* students don't see that racism is a real problem in Canada. I am trying to understand that it can be difficult for people to see the benefits that their race affords them. I am trying to understand that it can be difficult for people to see that our beloved Canada has numerous systemic and institutional problems. I am trying to understand that it can be difficult for people to believe that it's not just their hard work that they're successful, but rather the situation they were born into gave them a head start. It's much easier to believe the racism is a problem elsewhere (ie. the United States); it's much harder to believe that racism is a problem in your own country. As many people have encouraged me, it's important to make students aware of the hard truths, and trust that one day their perspectives will change. *I had a student tell me today that he did some of his own exploration on Reddit, and he was shocked and disgusted by the comments about Indigenous people. He then connected back to our class on Monday, and shared that he couldn't believe that some students believed the comments were "just trolling" and didn't mean anything. In light of the Gerald Stanley verdict and the fact that my grade 11 classes are learning about modern Indigenous issues in Canada via The Outside Circle, I decided that our "Article and/or Video of the Week" (AVoW) would be focussed on Colten Boushie's murder. Despite having a relatively natural entry point, I wasn't sure how to approach the subject. I knew that some of my students would believe that Stanley acted appropriately, as Boushie and his friends were trespassing and attempting to steal. Additionally, some of them, last week, told me that the only reasons stereotypes exist is because I (and others like me) talk about the stereotypes. They believe that if we just didn't talk about stereotypes, they wouldn't exist. I spent a lot of time over the week-end figuring out how I was going to bring the topic into the classroom, reading articles and watching videos. I considered waiting to discuss the trial at the end of our unit on The Outside Circle, because then students would have a better understanding of the ongoing impacts of colonialism and racism in Canada. My first error was not going this route. Instead, I chose to show the clip "Racial tension front and centre at Colten Boushie Trial". I chose this clip because it predated the outcome of the trial and because it gave voice to both sides: the reporter spoke with Boushie's uncle and farmers from the area. I gave the students the following "look-fors": Colten's uncle's thoughts; fallout from the possible verdicts; Facebook comments; farmers' perspectives; role of communication. Fortunately, I teach grade 11s the next period, so I had the insight from my errors to change the course of the class. We watched the videos with the same look-fors, but in the discussion, I spent a lot of time listening to the students and asking them questions to have them clarify and, hopefully, challenge their thinking. From what I understand, from the students who spoke, they don't think race had anything to do with either the shooting or the verdict. Nor do they think that racism or bullying is a problem. I'm not entirely sure how I'm going to address my classes tomorrow. We need to finish our writing for the AVoW video. After that, I'm not sure. Do I just move along with The Outside Circle? Do I need to apologize for my errors? Do I explain my errors? Do I have them read this post? Do I discuss bias, my bias, and that my goal is for them to be open to other ideas, even when the ideas are uncomfortable or outside their lived experience? Do I need to set a goal for myself to be open to various interpretations even if I believe they are racist? Should I try to address the trial once we're done The Outside Circle? Do I have them do some independent exploration of the trial? This semester I taught Grade 9 English, and I was instructed to make some changes in the course. Unfortunately, our literacy test results went down, and there is concern that Grade 9 English wasn't sufficiently preparing students for the test. (And, no, I don't think the purpose of school to teach students to take a test. ) I had (have) reservations about "teaching to the test", but the reality is that students need to meet the literacy requirement in order to graduate. I do have fears about this, as my final marks (minus the portfolio interview) seem "high", and I wonder about my expectations. What if my expectations are out of line and my students fail the literacy test? Our first unit was "Literacy Bootcamp", and I dreaded it. Fortunately, it turned out to be fine. I didn't use any of the pre-packaged literacy prep, but rather looked for current texts. My co-teacher and I selected texts that focussed on technology and social media, and it was easy to keep my eye open for news reports, editorials, and videos that fit these topics. We did direct teaching of reading strategies, answering six-line responses, news reports, and series of paragraphs. Our summative task was a test where students had to read an editorial, answer some multiple choice questions and answer two six-line open responses. In addition, students had to write a news report similar to the literacy test. They also had to write a series of paragraphs. Overall, the summatives accomplished what I wanted them to. That said, I am contemplating changing the placement of the "Literacy Bootcamp". I think I want to do it as the last unit. My rationale for this is that I want to see how much direct teaching I will need to with regards to reading strategies, quotation integrations, paragraph organization, and their readiness to complete a full persuasive essay. Our second unit of study was short stories. It was fairly typical of English--learn some literary devices and analyze how authors use literacy devices to communicate their themes. We also focussed on turning our observations into ideas, and supporting their ideas in well-organized paragraphs. There were two summatives: a test that assessed their knowledge of short story terms, as well as the ability to write an analytical paragraph in response to a prompt. Additionally, students were given a sight short story to read and write an analytical paragraph based on their independent reading. In hindsight, this seems repetitive, and I think that reading the sight short story and writing an analytical paragraph would be sufficient. The third unit was the study of the novel The Book Thief. I have taught this novel four times, and I love it. The majority of my students enjoy reading the novel, but the length can be overwhelming. I am going to try a new novel this coming semester: Flawed. I really liked the topics that we explore in The Book Thief, and those topics map over well to Flawed. The summatives for the unit were literature circles and an extended paragraph. I really liked the extended paragraph, as students wrote three paragraphs over the unit, then selected their best paragraph and polished it for assessment. On the other hand, the literature circles were a FAIL. I need to do some more work on structuring the literature circles this coming semester. I am thinking that the circles will only be done twice-weekly, and I will assign specific roles in an attempt help students facilitate their discussions. I have some thoughts on the exam, and I am betting on having some thoughts about the portfolio interviews, so I will reflect on those at a later date. I have been pondering various questions, in an attempt to clarify my thinking about reading. What is my overall goal? Students who read because they WANT to, not because they have to. Why do I want students to read for pleasure? Reading frequently improves reading skills. Reading frequently improves writing skills. 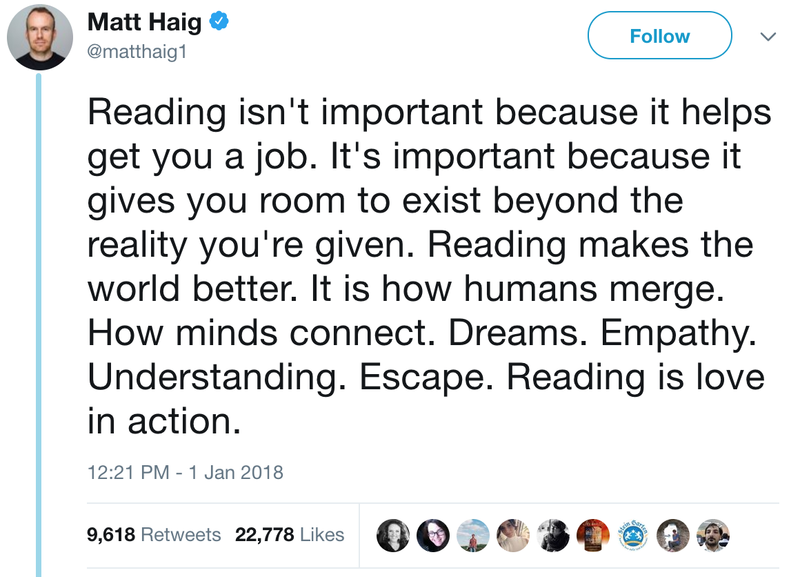 Reading allows students an opportunity to escape into another world. Reading allows students to build empathy for others' experiences. Reading allows students to build community and connection with other readers. Reading allows students to understand themselves. How can I force students to read for pleasure? This is tricky. It is hard to get some students to read for assignments or marks, so why would they read for pleasure? But I think that is part of the problem. There is pressure to do something, often artificial or contrived, with the book. Students have to prove that they read the book. It takes the joy out of reading. I know that we try to give students a choice in their reading, via the ISU, but students still often don't enjoy reading their chosen book, plus we put a bunch of parameters on what they are allowed to read. It is just a hoop they have to jump through..."get through these books then I never have to read again." I know some schools have enforced reading time, such as STAR (Stop Talking and Read) or DEAR (Drop Everything and Read). In my limited experience, these programs haven't been very successful. But this also tells me that maybe my thoughts about enforcing (encouraging?) reading in my classroom are unrealistic. Except that Pernille Ripp, a grade 7 teacher in the United States, has great success in rekindling reading in her students. (Obviously things would need to be adapted to fit the high school context.) Ripp shares that to get students to read for pleasure we need to give them time, we need to give them access to lots of books, we need to demonstrate ourselves as readers, we need to let them abandon books, and we need to let them book shop. If I want students to read, I need to give them class time to read. If it is something I value, then it deserves to be part of my valuable class time. I want a reading and talking about books classroom. Additionally, I'm not going to force them to do something with their reading. The success comes from them reading. I will see them reading. I will have conversations with them about their reading or lack thereof. That's my proof. So how am I going to work towards creating a reading classroom? Creating a reading class room is my new preoccupation, and to be honest, I am feeling a lot of discomfort about actually implementing this. Full disclosure: I contribute to students not wanting to read. Hating to read even. I don't intend to do this, but I do. I do because I always make them do something (Ripp) with their reading. They never just get the opportunity to read. But how do you get high school students back into reading? 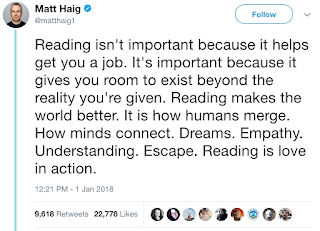 As an English teacher, I am always thinking about reading, but it hasn't been until recently that I have been thinking more deeply about reading. I think this is because my oldest two children are embarking on some independent reading. Ever since Marisa and Madeline were babies, my husband and I would read to them. Six years later, we still read to them (and now little Nora) every single day, with few exceptions. Towards the end of junior kindergarten, the girls started bringing home levelled readers. Those readers are painful and boring. We would plod through them. (And full confession, we would only do them once or twice a week.) It was the same in senior kindergarten, although Marisa was more enthusiastic, so she would read two or three times a week, and Maddy, maybe once or twice. My goal is to have my daughters LIKE reading, and I was afraid that this homework reading was turning them off. Fortunately, Marisa and Madeline had excellent kindergarten teachers, who were supportive of my refusal to do the levelled readers every night, especially when they weren't "feeling" it. This support was great, because they're experts in teaching reading, and another full confession, despite being an English teacher, I don't know how to teach the basics of learning how to read. As a high school teacher, I'm supposed (?) to get students who have already mastered reading. Now that the girls are in Grade 1, they are much more interested in reading, and often enjoy reading their levelled readers every night. More importantly, they are also interested in whatever I am reading and just words in general. When I am reading to them, they choose to read sentences here and there, and they like pointing out the words as we go along. My goal is for them to be like me: someone who likes reading, so much that as a child, my consequences for not doing my chores was having my books taken away. This brings me to reading in high school. When do students, who loved or at least liked, reading, stop reading? And I don't mean for school. I mean, for pleasure. How do I get high school students--those who don't see the point in, or pleasure of, reading--to read? I have been thinking about reading, especially in the context of the independent study unit, a lot lately. Many English courses have an ISU component, where students are required to read a book independently, then do something with it. (Often an essay or a presentation or both.) I'm not a huge fan of ISUs in the traditional sense. While I still did a traditional ISU with Grade 10 Academic English, in Grade 11 College-Preparation English (ENG3C), I did not do one, and in the Grade 11 University-Preparation English course, students did an independent blog. Next semester, I am teaching two classes of ENG3C at my new school, and I thought that I could do a traditional ISU with my classes. In fact, I said, "I'll do anything once." But I'm not so sure. In general, students in ENG3C do NOT read for school unless it is in the classroom and forced upon them. Reading for pleasure is not happening, for the most part. So what do I do? As I was pondering my questions about reading, I came across, "How to Stop Killing the Love of Reading" by Jennifer Gonzalez, based on her interview with Pernille Ripp, author of Passionate Readers. This ignited a spark in me. It has made me more resistant to the traditional ISU and is forcing me to re-envision my daily teaching. I am currently reading Ripp's blog to help me figure out how I can help students become readers. And this is where I will leave off. I'm working on finding answers to get me started for February, and I am thankful that I came across Matt Haig, Jennifer Gonzalez, and Pernille Ripp. In the role of teacher, I often forget that learning new skills can be scary for students. I forget that it can be overwhelming to be introduced to new essay-writing styles, quotation integrations, and research methods. The human fear of appearing stupid is strong. She welcomes. She greeted me at the entrance to the ice, and held my arm to guide me to the centre. Right away I felt physically and mentally safe. She differentiates. Our small class has five skaters, at varying levels. She works with each of us individually to develop skills at our own pace. She has high expectations. Apparently, I will be skating backwards by the end of my lessons. She encourages. She lets us know how to improve in a positive manner, and she celebrates our successes, no matter how small. Essentially, becoming a student has reminded "teacher me" to be sensitive to students' trepidations. For some students, showing up to learn the unfamiliar is a success in itself. I need to welcome, differentiate, set high (but achievable) expectations, encourage, and celebrate...both my students' successes and my own. From 2007-2017, I taught history and English at Orangeville District Secondary School. This past September, I moved to Westside Secondary School, where I teach English.